The Cobblers have strengthened the club’s youth and academy coaching department, with former Brackley Town manager Jon Brady joining the Sixfields staff on a full-time as part of the restructuring. Former Rushden & Diamonds player Brady has taken up a full-time post as the club’s professional development coach, and will be responsible for Town’s Under-18 squad. Mark Lyons, who previously looked after the U18s, will take on the role of assistant academy manager, as well being the lead youth development phase coach, responsible for players from the age of 12 to 16. Lee Garlick will on a new role of overall head of coaching for the academy, overseeing the progression and development of the coaches. As well as playing for Town’s county neighbours Rushden & Diamonds and Kettering Town, Australian Brady also turned out for Hayes, Woking, Chester City, Stevenage, Hereford United, Kidderminster Harriers and Cambridge United in a lengthy career. After retiring as a player, he managed Brackley Town for six-and-a-half years, and for the past 12 months has been coaching the Cobblers U16s on a part-time basis. Brady’s full-time appointment strengthens a department that has produced the goods in recent years. Academy products Joe Iaciofano and James Goff have signed professional contracts for next season, while fellow academy graduate Shaun McWilliams made a big impression playing in the first team in the final month of the campaign. 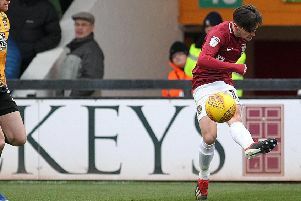 That trio join a list of players to emerge from the Cobblers academy in recent seasons, a list that includes the likes of Ivan Toney, Michael Jacobs, Luke Chambers and Mark Bunn who have all gone on to play in the Premier League or Championship. “I have been delighted with the progress we have made in recent seasons and these changes will make us even stronger,” said Cobblers academy manager Trevor Gould. “I feel these appointments give us an excellent balance of youth and experience, of technical knowledge and of playing experience. “We have seen three players come through to join the first team squad in recent times, and with the batch of players we have coming up through the age groups, these changes will give those players the best possible chance of following in their footsteps. “Mark Lyons has done an excellent job as lead foundation coach, he has helped develop a number of emerging players and he gained a lot of experience taking the under 18s last season. “He has an excellent overall knowledge of the academy system and our players, and he is well placed to put this knowledge into practice by taking on these new roles. “I will value his input as assistant academy manager and lead youth development phase coach, helping to prepare players from the age of 12 upwards for what they will experience as they progress through the ages. “Having Jon on board full time will also be a huge help.